Monitoring plans are important tools for organizing your data logging and data gathering effort on a commissioning project. At a minimum, they can help you think through exactly what you need to monitor and how you will go about doing it for the system or systems you are studying by documenting the list of data points and sensors you will require along with the necessary sampling frequency. And if you want to get fancy, you can group the sensors by the logger they will be associated with and include items like the data logger serial number, the location where the logger is to be deployed, and details of how you want to install the sensors. You can even provide a link to a screen shot of the logger software launch information and a picture of the installed logger. On large projects, these details can make it a lot easier for you to remember exactly where the loggers are when it comes time to pull them back in and facilitate having others work with you to deploy and retrieve them. 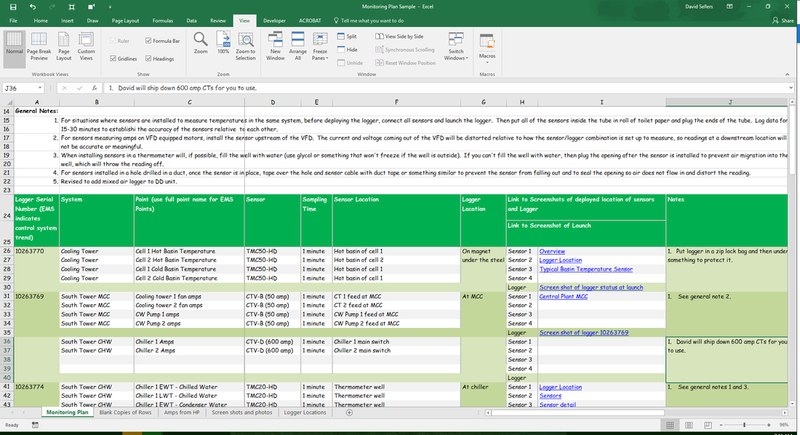 The links below will take you to a black copy of the spreadsheet I use as a monitoring plan and also a copy of the spreadsheet after it was filled out for a project a while back. If you are looking for a bit more of a discussion on how to go about deciding what to monitor, you may find a string of blog posts I wrote regarding how I went about logging a heating hot water system to be of interest.